Mid-Ohio Race Review: This Frenchman’s On Fire! 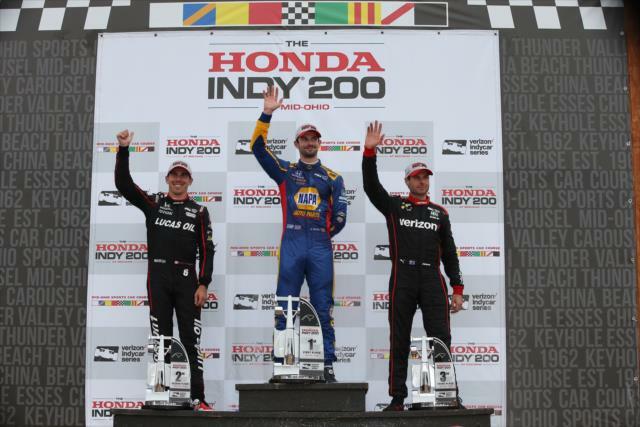 Pole sitter Alexander Rossi’s victory for Andretti Autosport was never really in any doubt, as is so often the case at Mid-Ohio, although NBCSN’s superb coverage (on CNBC) of Sebastien Bourdais’ Napoleonic battles from deep in the field made it at times almost seem like it. Demonstrating how Sunday really wasn’t his but rather SeBass’ day for swiping an amazing eighteen positions going from last to sixth, the Indy 500 winner celebrated his race win by embarrassingly high-siding and stalling his NAPA car on track’s edge while attempting, unsuccessfully, to cut donuts. During pre-race both Rossi and Josef Newgarden mentioned the lack of a morning warm-up, highly unusual for IndyCar. Already putting everyone in the paddock on edge were a string of chaotic practice and qualification sessions, with umpteen incidents and cars leaving the terrible track. Under this foreboding atmosphere, of course the race proceeded under ninety straight green flag laps – though it wasn’t without its incidents. Rossi and Will Power led the bunched up field to the start, with several drivers back in the pack nearly making and then, in fact, making contact. Rossi’s trudging pace from pole, or what Paul Tracy called a “dirty move,” was reviewed but like so many other incidents during the day no action was forthcoming from race control. Newkid passed Ryan Hunter-Reay for third as cars flew around corners sideways, with contact galore during the first few turns of a track barely wide enough to fit two cars in many places. Sato then spun out after being hit from behind by Max “Paris” Chilton and came to a halt right in the middle of the track; fortunately everyone was able to avoid him. Paris received a drive through penalty for it, later suffering a tire change mishap in the pits and finishing laps down after starting sixth. Cars then became strung out behind Rossi, whose lead mushroomed as the laps went by. At one point Townsend Bell candidly mentioned “a rare passing opportunity here,” letting the real truth slip out about Mid-Ohio. Bourdais instantly began battling from the rear, getting Sato in turn four, then Spencer Pigot in the keyhole and next Tony “TTCIQ” Kanaan. Soon thereafter Graham ran off course for a rough ride through the grass, kicking up ‘Rahal rooster tails’ in what wouldn’t be his last such foray of the day. Rossi continued to lead Power, Newgarden, Dixon and Wickens. Power pitted while Newgarden harried the leader, who was being held up in traffic by Jack “Off course” Harvey in that hideous pink car of his. The defending champ went over and under (outside then inside) to get around Rossi – with a lil’ nudge thrown in for good measure – for the lead of the race on lap 26. Sadly for him, it wouldn’t last. Newgarden and Dixon pitted while Rossi stayed out and they left in the same order after service. Wickens had previously pitted on lap 15 and inherited the lead once Rossi finally pitted on lap 30. Confusion reigned in the booth briefly as to who was actually leading the damned thing. Rossi’s two stop race strategy proved to be the winner, stretching his tires and fuel to the limits. Dixon nearly made contact with him as the leader reentered the fight, the two bumping as Alex held on to the spot despite his cold tires. By this point Bourdais had climbed fourteen spots to tenth, even though that mid-race lull that begins early at Mid-OH and lasts late had begun to set in. With a toasted right front Wickens was forced to pit again, giving Power the lead over RHR, Newgarden, Rossi and Dixon. 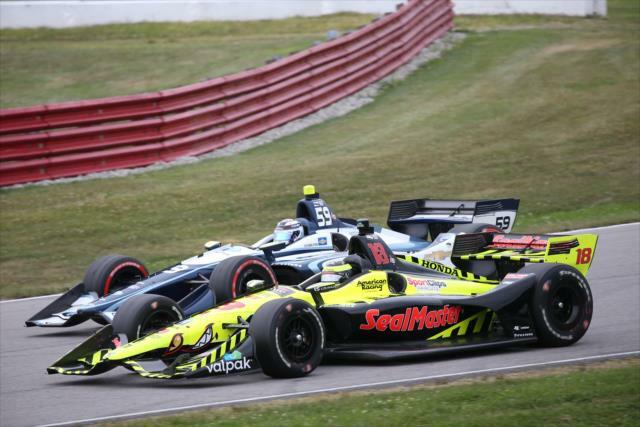 It was a surprisingly engaging race especially for Mid-Ohio, as the new cars, favorable weather and Bourdais – or rather NBCSN’s (on CNBC) coverage of him – helped the show immensely. Our star of the race next went around Rahal in spectacular fashion, up to eighth and counting just beyond the midway point. Rossi led Wickens, Newgarden, Power and RHR although that’s misleading, as Rossi’s lead was by then over twenty seconds. In other words, insurmountable. Once he’d pitted from the front, Wickens led briefly again before himself pitting and rejoining in third, leaving the race back in the hands of Rossi. He was followed by Power and further back in fourth Newgarden and Dixon with twenty to go. Enjoying a huge lead, Rossi made one bobble in the final stages, dropping his left tires off course while exiting the keyhole. Other than some minor soil erosion however, no harm was done and he maintained a whopping eighteen second lead. Such is the story at Mid-Ohio. After laps of trying, SeBass finally managed to get around fellow Frenchman Simon Pagenaud for seventh spot, then immediately set about harrying the notoriously hard to pass RHR for sixth. The two tangled fiercely and banged wheels, though after still another review no action was taken. Bourdais did eventually get around him by pulling off another spectacular outside pass with six to go. If the race would have been ten laps longer, the Frenchman likely would have won it. He was that thoroughly on fire. This entry was posted in Alexander Rossi, CNBC, Graham Rahal, IndyCar racing, Jack Harvey, Josef Newgarden, Max Chilton, NBCSN, Paul Tracy, Robert Wickens, Ryan Hunter-Reay, Scott Dixon, Sebastien Bourdais, Simon Pagenaud, Spencer Pigot, Takuma Sato, Tony Kanaan, Townsend Bell, Will Power and tagged 2018 season, Honda 200, IndyCar, IRR, irreverent humor, Mid-Ohio, Mid-Ohio Sports Car Course by IndyRaceReviewer. Bookmark the permalink.